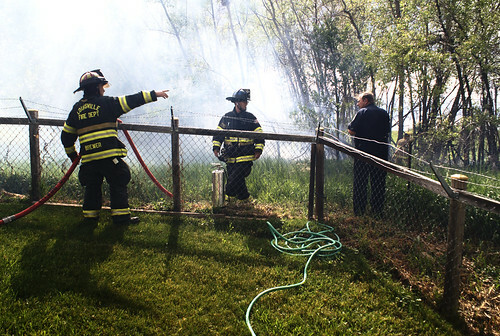 Luckily, the house on the cul-de-sac was not on fire but the grass in the Open Space right behind it was. 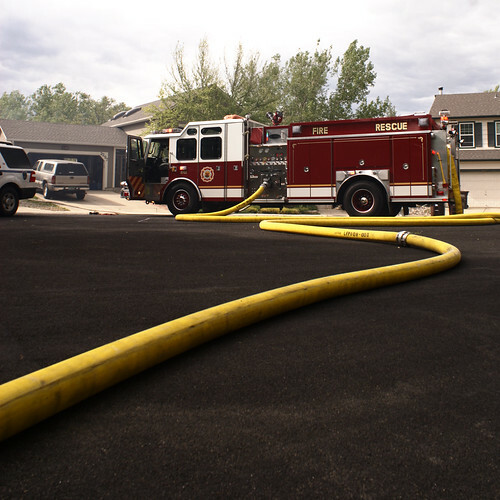 An avid bicyclist had seen the smoke and called it in as a small grass fire. The first responders addressed it with a garden hose quickly provided by a neighbor, hoping to put it out but the winds had another plan and the fire quickly used up all the dead fuel in the brush as it grew. Louisville Fire Department sent out every kid's dream, a real fire truck, within the next 5 minutes and the awesome firemen went to work quickly. It was the first time that the fire hydrant in our neighborhood had ever used to tame a fire in the two decades and more that it has stood there, a silent witness to some of the craziness that abounds. A friend who is a volunteer fireman with Louisville Fire Department reported that he was on standby, in case backup was required. I was very grateful that his services were not required! 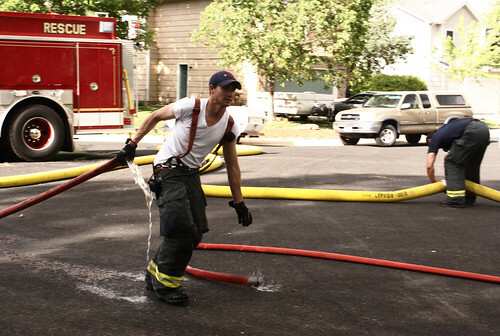 I played the role of the papparazzi but was careful to stay out of firefighters' way. 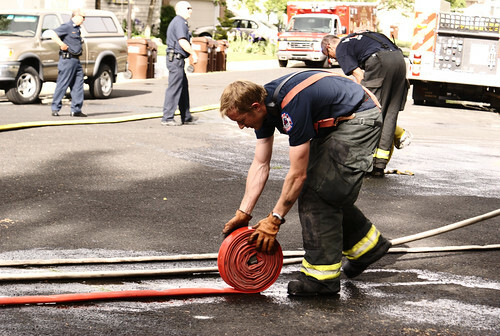 I didn't get any decent shots of where all the action was taking place but we had the pleasure of watching these strong firefighters, all volunteers from the community, roll up the hoses and put away their equipment. It took almost as long as it did for them to put the fire out. 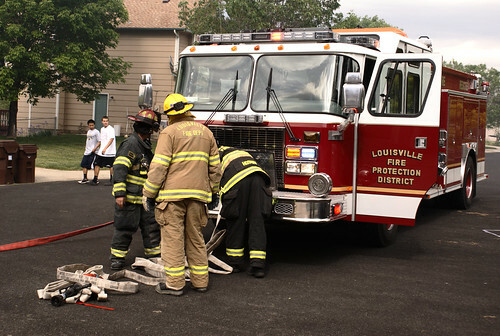 Thank you, Louisville Fire Department! We think you rock! This fire took place 3 weeks ago and within a week of that, there was a yearling bear that decided to hang out in the trees of Louisville. He was tranquillized and taken back to the wild, far far away from humans and their garbage. Might I say that we get more than our share of the unusual? So is it any surprise that I find myself replicating this theme in the food we eat? One of our latest faves is apricot chicken. Fruity. Spicy. Juicy. Not for everyone as it is kissed by caramelized sugar. Definitely a departure from the usual. My recipe for apricot chicken is a marriage between the recipes from my two favorite Parsi cookbook authors, Jeroo Mehta and Niloufer Ichaporia King. My touch? I used fresh apricots instead of jardalu or dried apricots. I also adjusted the amount of sugar in the recipe and enjoyed the tart fruitiness that apricots lend to this dish. 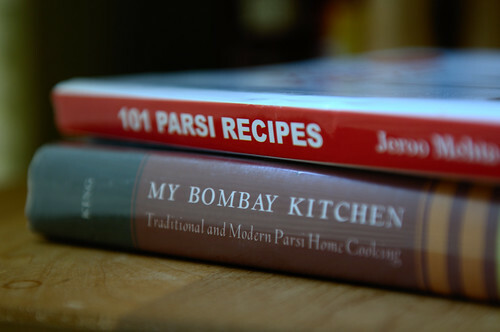 By the twentieth century, Parsi cuisine had acquired many layers on top of the meat- and dairy-centered diet of the Persian plateau. To being with, the tropical bounty of the coastal plains of Gujarat must have been a source of great excitement to Parsis after years of wandering through the Arabian Desert and two decades on barren Diu. They had brought with them memories of the rich food traditions of ancient Persia, still seen in the cooking of Iran's Zoroastrians - an enduring love for saffron and rice; for meat cooked with fruits and vegetables; for fruit and nuts; even coconut, which was known in Persia as the Indian nut; for sweetmeats and wine and the taste of sweet-and-sour. On the west coast of India, Parsis came to the source of the spices and coconuts they'd enjoyed in their Iranian homeland, to abundant seafood, and, to top it all off, to mangoes and other tropical fruit. Parsi cooking absorbed Hindu influences, and in time, those of the Muslim conquerors of India, who themselves came bearing post-islamic Persian food traditions. Chiles - or chillies, as they've come to be called in India - tomatoes, potatoes, cashews, and other New World food trophies followed in the wake of the Portuguese who arrived at the end of the fifteenth century. Exposure to the West through travel or constant mingling with Europeans brought in custards, gratins, soufflés, patties, cakes, and a love for pastry, cheese, and chocolate. According to her, this led to an urban Parsi cuisine with an immense range of tastes and techniques, a real magpie cuisine. The history of Parsi food is a great story of how food evolves. We use what we know and apply it to new and unknown ingredients, discovering new tastes and flavors in the process. We watch others, learn from their techniques and make their recipes our own by changing a little bit of this, adding a little bit of that. That's the beauty of food; and culture, too. It's always changing and adapting. 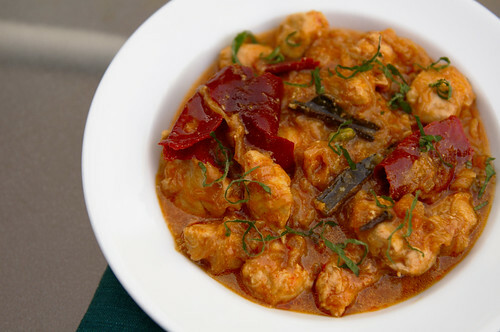 Anita's red chillies are gorgeous in this curry, too! Add thinly sliced onion and cook on medium heat until they are soft and golden brown in color. Add ginger and garlic and cook for another 3-4 minutes. Add the whole spices: cumin, cinnamon, cloves, cardamom and red chillies. (Wow! All of them start with a C!) Cook for a few minutes, stirring until the spices have released their aroma. Add chopped onions and diced chicken tenderloins. Cook on medium-high, until the chicken is lightly browned on the outside. Stir only as necessary. In another saucepan, add 2 tablespoons of sugar and allow it to caramelize over medium heat. Do not burn the sugar. Add the warm water, a little bit at a time, disssolving the caramelized sugar as you do so. Add halved apricots to the warm water, bring to a boil, lower the heat and cook covered until apricots are soft and tender. About 5-7 minutes depending on how firm your apricots are. Add apricot mixture to the chicken when it is almost cooked. Add red chilli powder, if using, and salt. Break down any large chunks of apricots so that they form the base of the sauce. Simmer on low until the chicken is cooked. Garnish with chiffonade of mint, if you wish. I did. Serve with rotis or over steamed basmati rice. 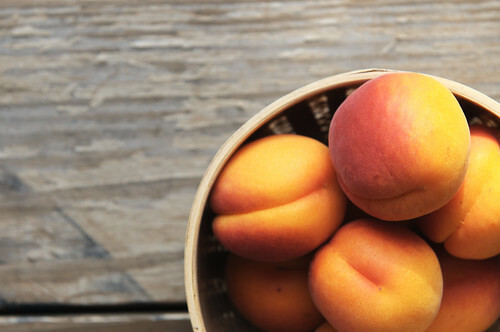 If your apricots are very tart, then you may need to add more sugar to balance the flavors. There's no need to caramelize it. If they are sweet, start with less sugar. King's recipe suggests using between 1/2 to 3/4 cup of sugar while Jeroo Mehta uses only 1 teaspoon. Add more water to the chicken if you want it soupy. In both original recipes, jardalus are soaked in water for at least 3-4 hours and then poached till they rehydrate and plump up again. The poaching liquid is added to the chicken but the whole jardalus are pitted and added to the dish just before serving. The pit may be broken and the kernel used for garnish. However, since I used fresh apricots, there was no need for any of this. Instead I mashed the poached apricots and allowed the pulp to form the base of the sauce. 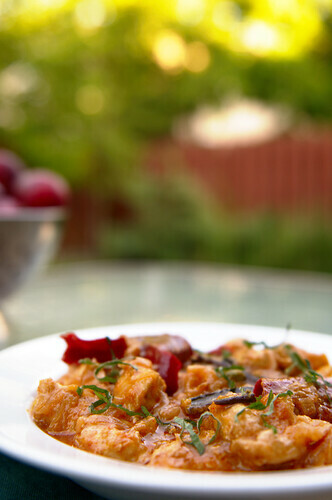 It is such an unusual fruity flavor that it ties with my kadipatta chicken as the favorite way to eat chicken. A little sweet. A little sour. A little spicy. Do you think you might want to step out of your comfort zone and try my apricot chicken? Awesome pics! No, not the hunks - the chicken!! I so want that book now! And guess what - it is peach season here as well! What a nice coincidence! Interesting article on a simple topic, like the flow of words. Very neat pictures manisha, the flavours must have been so different..I like that picture faceup, so well captured! You have such an eventful life!!!!! !the pics are just super! The firemen are awesome as is the curry. And yep, I agree, you do lead a very eventful life. I heard/read the word jardalu after such a long time. Can't even remember what they are used for but this looks as good as any. Oh Manisha this sounds so good! I had the apricot and chicken combo sometime before but a very different kind of preparation... more mediterranean kind and liked it. This is a must try sometimes. LOVE, LOVE MBK! Isn't a terrific read? I have been meaning to do a post about the book myself for a long time, but then, I have been meaning to do a lot of other posts as well. I had the opportunity to meet Niloufer Ichaporia King during the I made your lemon pickles and showcased it in Slow Food Nation. Some of her pickles were made too, and I was honored when she asked me what I thought of them and what it lacked- and you know me, I told her may be a pinch of salt and she added it. Very sweet and down to earth lady. I have taught this recipe in class with dried apricots and it worked very well. Kitt, maybe I can bring this to our next SNB! Anita, the hunks, too! ;-) Let me know if you do try it with peaches! Valli, thank you! And yes, very different from the usual onion-tomato base. This is oniony but also fruity. forkie, that we do. There have been times when all I want is boring. But a fire is scary, when it's so close to the houses and the winds pick up. That kind of eventful no-one needs! Jaya, our firefighters do a darned good job and we are very proud of them. I haven't eaten a real jardalu forever. I used to love to crack the pit for the little kernel inside. The dried apricots you get here are not dried enough and have too may things added to them - sugar or corn syrup, mainly. Priya, small world! And how very cool. Maybe our paths crossed literally and we never knew it! Soma, do you have the recipe for the Med version? ET, so well-written! Just do it! Miri, you are the lucky one! Shankari, and you are even luckier! Did you use the regular Sun-whatever apricots? That's super....I need to be more creative with my chicken dishes...seems like I always go with something Thai..thanks for the reminder to BRANCH out.